Although we all talk about the Moon, think about the Moon, look up at the Moon, the Moon still remains a mystery to us, it has been this way for aeons, and will be for aeons to come. Because of the mystery, the Moon holds a fascination for everyone, and who can help being riveted by the beauty of a full Moon and what the Moon can reveal. The light of the Moon seems to contain a magic all its own, yet something that we all wish to share in, the allure of the Moon has a place in our hearts, as it did in the hearts of our ancestors. The Moon has connotations for many religions, and the word Moon comes from the Greek word meaning “measure”, there are many Christian celebrations with a connection to the Moon on specific dates. The ancient Egyptians discovered that although the Moon shape shifted with precision regularly, it did not provide an accurate measure of the seasons, and there was a miscalculation by several days. The regularity of the Moon’s ability to shape shift was a way for ancient civilizations to be able to keep time, and the cycles of the Moon were the basis of the earliest calendars. Farmers needed to know when to plant and to harvest, merchants needed to know when to expect to have crops for sale. It was also necessary to have an accurate gauge of the season to be prepared for the annual flooding of the River Nile, none of which could take place without an accurate measure of time. The next calendar designed by the Egyptians was based on solar cycles, which gave them a more accurate measure of time. There was an early awareness of the Moon’s connection to the oceans of the world and the cycles of nature, the Moon affects the creatures of the sea, many of which mate and spawn during particular cycles of the tides. Some fish are easier to catch during the full Moon, birds and animals are all affected during the phase of the full Moon, animals are more active at this time. 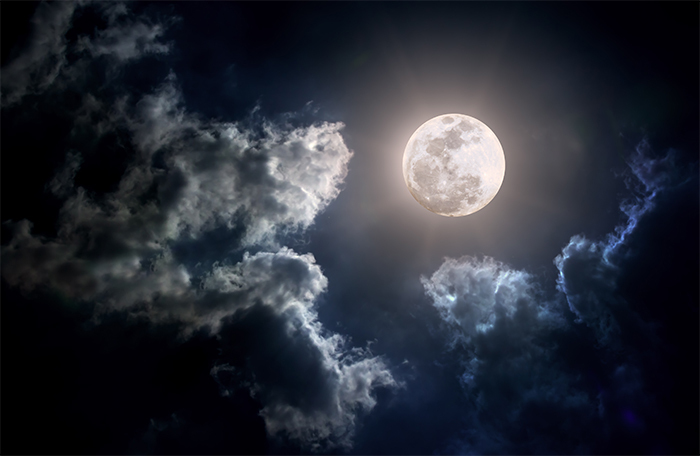 Ancient civilizations used the Moon to predict weather patterns, and it was likely that this was thought to be magic. It is known today that tornadoes and hurricanes tend to occur during the phases of the New and the full Moon, more than any other time, and there is a tendency for more rainfall during the first quarter of the Waning Moon. 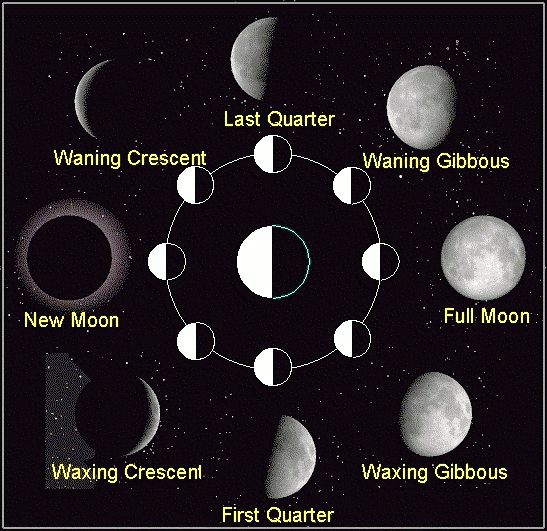 The human pregnancy gestation period is calculated by lunar cycles. There is the legend of the Moon Maiden who collects the wishes and dreams of all living creatures on earth, they are then dropped into a goblet and swirled together before they are sprinkled back on Earth and become dew. The German goddess Frigg is said to live on the Moon spinning the lives of mankind, while the Chinese goddess Ch’ang O stole the potion of immortality from her husband. She drank every drop and flew to the Moon to escape, she now lives there contentedly after being given refuge by the hare who resides on the Moon. When building a wooden fence you want to last, lay the foundation and set the posts while the Moon is waning, then wait until the Moon’s horns point skyward, you may then lay the lower rail. When the Moon’s horns point to Earth the fence can be completed, when building a fence in this way it will be sturdy and last. When the Moon is waxing hooks for fishing can be set, when the Moon wanes fish by the light of day. If you bow to the new Moon good luck will be yours. To assure an auspicious marriage, marry twenty-four to forty-eight hours after the full Moon, and the Scottish believe that a wedding should take place when the Moon is full, thus ensuring a long and happy marriage. The Moon lunation takes around twenty-nine and a half days, starting from a full Moon and it continues until the next full Moon. For centuries civilizations bowed to the power of the Moon, crops were planted according to the Moon’s phases, there were many rituals celebrating the power of the Moon. The Moon is still recognised today as having particular powers that affect planting and growing, people’s emotions, and the ocean tides’s of the world. There is still intrigue regarding the Moon and it holds a certain fascination for most people. The Moon plays a very profound role when it comes to spell casting, as you make magic be aware that the subconscious mind is ruled by the Moon. Those interested in magic and spell casting can enhance the power of their spells by becoming acquainted with all the phases of the Moon, and how to apply them, by tapping into the energy of the Moon you will be guided in your magic practice. Your life could be transformed by working with the different energies of the Moon. Before performing spells it is a good idea to meditate and help yourself to reach an altered state of consciousness. If you believe in higher powers and higher energies, you will naturally respond to the waxing and waning of the Moon’s energies. When casting spells you are working with the subconscious mind, the elements, and with energy, the Moon is accessed and its transformational powers utilised. Spells require you to ignite the magic that you will be invoking, and then working with the universal life force, you become as one with the energy flow of the unseen. If you are patient, waiting for the correct phase of the Moon to make your magic will enhance the ultimate results of your spell casting. This is the crescent Moon when see the first peak of light, this is a time of newness, the beginning of relationships, the beginning of a new venture, the energy of this phase promotes new beginnings on any level. This is the time for change and for being open to, and looking for new opportunities, tilling the soil and planting seeds actually, and the seeds of ideas. The Moon is beginning to gain strength as it grows in size, and goes from a new to a full Moon, this is a perfect time for growth and increasing things, growth within a relationship, financial growth, a time for learning and gaining knowledge. If someone is thinking about pregnancy, this is a time of fertility, and it is an exceptional time for communication, in a business matter, or within a relationship. This is also an auspicious time for any legal matters, especially those where finances are concerned, if a healing spell, or healing of any type is needed, this is the time. 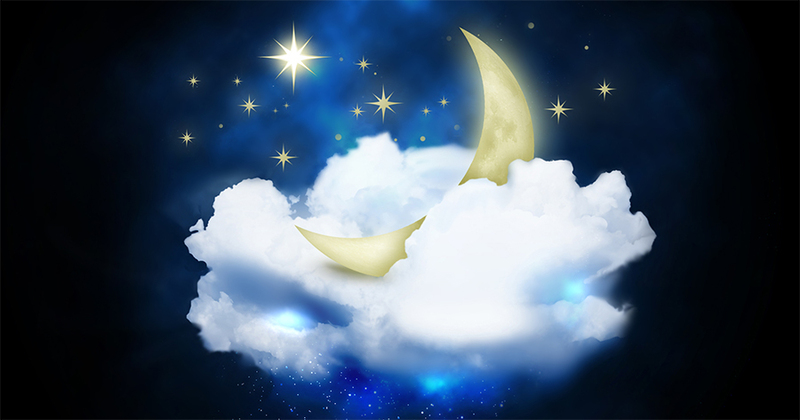 During the phase of the Gibbous Waxing Moon anything to do with increase is compatible; this is a good time for minor magic as the lunar energy is waning. The full Moon is the most powerful phase, this is when the Moon is seen in its glorious fullness, this is a time of enlightenment and heightened psychic awareness. It is a time when everything comes together, it is a time of ideas, also a time of commitment, to a person, idea or project. It is also a time of family, and or friends coming together, any spell is well aspected during this phase of the Moon. The Waning Gibbous Moon is suitable for rituals associated with letting go, and banishing, if it is time to clear out the old and prepare for the new, this is the Moon phase to spell craft with. As the Moon decreases in size, it goes from full to dark, and this is a time of letting go, it is also a time of completion. If you have been wanting to change something in your life, this is the perfect time. It is also a time of ending anything that doesn’t work in your life, this may be a habit, a relationship, or paying attention to issues associated with legal matters, this is a time to pay attention to anything that you have been procrastinating about. This is a time when the Moon is not visible in the sky, this phase lasts for approximately two or three days, and if there is something in your life that is unnecessary, this is the time to release it. It is also a time of recognising what you have accomplished in your life, and a time to plan for what you want to attain in the future. If you have been in a quandary and are unsure how to progress, this is the time for you to go within and be honest with yourself about what is right for you at this point in your life. If you enjoy meditation this is a perfect time for that, if you have never meditated, there is no better time to begin. There is folklore which deems the ten day period following the appearance of the full Moon holds a special magic, and those who take notice of the daily attributes and use them, will become very powerful. An auspicious time to begin anything new, also a lucky day for babies to be born, it is said they will lead long and charmed lives, and they will have all that they need. Although if someone becomes ill in this time period, it will take a considerable amount of time for them to recover. This is a particularly special day, with a vibration towards thriving on all levels, it is particularly auspicious for finances, it is a good time to sell anything and an exceptional time to plant anything that grows. This is a strange day as it seems that much theft takes places at this time, but by the same token the thieves acting on this day are usually caught very quickly. Anything to do with building, construction, remodeling and decorating will be successful on this day, and strangely enough children born on this day may be drawn to a career in politics. If not politics at the very least they will have an enduring understanding of right and wrong and will apply this throughout their life. Apparently this is thought to be the best day of the year to conceive a child, and the weather on this day is a mark of what the weather will be like for the rest of the month. It is also a day ripe with promise for new projects and ideas. This is a perfect day for meditation and soul searching, a day to pamper and a day to tune yourself inwardly. This is also an exceptional day to begin a voyage or vacation, it is also a wonderful day for growth and adventure. If you are single and looking for a partner this is a particularly auspicious day to find your mate, this is a day of opportunity. This is also a very lucky day and if you need some luck in your life, this day it just may come to you. This is often a day of low energy and you are open this day to catching a cold or virus, if you fall sick on this day stop and pay attention to your body and give yourself time to recuperate. This is a day where you will feel especially sensitive. It is said that it is better not to look at the Moon on the ninth day because the energy can be unsettling and it is thought it is not good for your skin if you look at the Moon on this day. This is a day you may feel a little on edge, it is a day to be patient and not rush into anything, or do anything in a hurry. Children may be erratic on this day, it is possible children will flout authority on this day. For each month of the year, there is a full Moon, if two full Moons occur in one month, it is referred to as a blue Moon, each year there is one blue Moon, for each month the Moon is given a different name. The name given for the January Moon is, Wolf Moon, this is when shedding and cleansing takes place, the old year is released and the energy of the New Year is beginning. This is a time for releasing yourself from the past and starting anew. The name for the February Moon is, Ice Moon, this is a time for soul searching, for taking an inner journey. This Moon is referred to as Worm Moon, a time of new beginnings and exploring new territory. The name of this Moon is, Growing Moon, this is a time of gathering and growth, it is a time of starting things. The name for this Moon is, Hare Moon, this is the time of nourishment, mentally, physically, emotionally, a time to pay attention to your needs and the needs of those you love. The Moon name for this month is, Mead Moon, this is the integration of the yin and yang within us all, it is a time of attunement and understanding. The Moon of July is called, Hay Moon, a time to look at your life and to think carefully and make plans for the future, and to look at what you need to pay attention to. This Moon is called, Corn Moon, this is a time to lay to rest old hurts and emotional pain that you have been holding onto that is excess baggage weighing you down. It is a time to release and move on, a time to be open and flexible. This Moon is called, Harvest Moon, whatever you have started this is the time for completion, tie up loose ends, trim stray edges, pay attention to that which you have left undone. Look to the future with a clear conscience and a clean slate. The name for this Moon is, Blood Moon, this is a compelling time to build, to begin, to create, to start something and flow into a new way of being, also a time to shed old useless habits. This Moon is called, Snow Moon, this is a time to look at what makes you tick, and to reassess what it is that truly works in your life, and what doesn’t work. It is a time of honesty and reappraisal of everything you do and how you do it. The Moon for the month of December is called, Cold Moon, this is a time to cut away all that is unnecessary or extraneous in your life, just as dead branches are cut from a tree, or plants are pruned to help them grow new shoots. You cannot progress with excess baggage in the way of outmoded thoughts and ideas, be open to explore possibilities. When spell casting, holding rituals, or for any magical practices it is helpful to know the meaning of each day of the week, this way you are able to combine complementary energies to enhance power. This is the day containing the energy of inspiration, psychic awakening, or psychic endeavors, implementing or creating new ideas, using your creative ability, working with divine energies, healing, channeling and any type of psychic work, and is ruled by the Moon. This day holds the energy of protection, amorous interludes, confidence, poise, strength of mind, body and spirit, and is ruled by Mars. A perfect day to go for a job interview, or to tackle any matters associated with work or career prospects, it is a day of researching and for intellectual delving, if you are making travel plans this is a good day to purchase or book your ticket, and it contains the energy for planning. This day is ruled by the planet Mercury. The energies of this day are conducive to all matters spiritual, the occult, psychic work, and connection with matters legal, and for paying attention to finances or organising your finances. This day is ruled by the planet Jupiter. If you have felt any inclination to make yourself, or your home over, this is the day to do it, it is also the perfect day for romance and being noticed by that special person. This day is ruled by Venus the planet of love. Any planning of future projects and matters to do with the home, personal relationships, or personal goals can work with the contained energy of Saturday, it is also a day of kicking useless or bad habits, and bringing to an end anything that isn’t working in your life. This day is ruled by the planet Saturn. This day is imbued with the energy of healing, mind, body, soul, it is also a day of astute decision making, it is a day where you will feel unusually insightful and be able to find the answer to problems that may have eluded you. It is a day to call upon divine guidance, and to expect serendipitous events to take place, it is also a day of closeness and friendship. This day is ruled by the Sun. The Moon has a magical quality and an otherworldly allure, and anyone who has worked with the Moon’s energies when spell casting can’t dismiss the effect it has. The Moon almost seems to be a wise and powerful magic creature, who has an effect on our emotional being, and the Moon will always be there to add power and intensity to your occult practices. Each person would be wise to learn as much as they can about the Moon’s power and to use the Moon’s energy with respect and appreciation. Before invoking the Moon for magic, have an intention, be certain about how you are going to use the Moon’s energy, this enables us to direct the power we are applying. Human emotions reach their peak during the phase of the full Moon, this accounts for the change in people’s behavior at this time, as the tides are affected so too are out moods. Because the Moon affects the emotions in a way that is not logical or rational, more people tend to fall in love when the Moon is full. The Moon is part of our everyday life yet it will always be surrounded by a certain mystery, the Moon has the ability to shape shift constantly. The Moon has a magnetic quality, and because of its link to emotions it is the starting point for successful magic, the Moon works beyond the boundaries of logic. Conducting your magic by taking into consideration the phases of the Moon, you will without doubt add power to any spell you cast, the Moon provides the spark to ignite your spells. In order for you to spell cast with a certain control, you must understand when and how you are affected by the Moon, this way you will cast your spells with awareness and are able to channel and project the energy to manifest what you wish. With the assistance of the wonderous Moon magic you are more likely to manifest successful spells. Because un-channeled energy can create chaos, conduct your Moon magic spells with care and consideration and only invoke in the spirit of doing good. Before beginning any magic practice begin first by deciding what it is that you want to invoke, once your thought goes out to the universe, and you call on the assistance of the Moon, the magic begins. For those interested in working with the energy of the Moon, keep a diary of the phases of the Moon and note how your emotions are affected, and the ebb and flow of your energy. Take note of your moods, your behavior, and document if there are changes associated with your psychic awareness. You can create an altar in your home dedicated to the Moon, use a small table and cover it with a piece of silver fabric, and as the Moon’s metal is silver, you can decorate your table with silver objects. Candles can be placed on the altar, use white for a full Moon, black for a dark Moon, blue for the waning Moon, silver for the new Moon, place figurines of mythical gods and goddesses. Use incense, burn lavender for a dark Moon, jasmine for a full Moon, although anything that feels right for you can be placed, lit, or burned. The three phases of womanhood are represented by the phases of the Moon, the waxing Moon is the maiden, the full Moon is the mother, the waning Moon is the crone. It is very healing to meditate by the light of the Moon, imbue the mystical and magical properties of the Moon, think of yourself bathing in Moonlight. Many goddesses are linked to one specific lunar phase, call on the goddess Persephone who became the Queen of the underworld after being abducted by the king of the underworld Hades. Since ancient times people have celebrated the Moon and the magic of it, the Moon is always thought to have feminine characteristics. There is the Chinese feminine, yin, to the Mayans the Moon represented Ix Chel, the old goddess, to the Greeks the Moon was Artemis, and when we need courage and strength, she is the one to call upon, also known as the maiden. The Moon was represented by Diana to the Romans. Inanna was a very unusual goddess and the deity of the morning and evening star, Inanna’s energies are associated with transformation and rebirth, and she is especially effective if you want to release yourself and move forward, Inanna is one of the oldest deities. Freya is the daughter of the sea god Njord and twin sister of Frey, she is the goddess of love, she was also the leader of the warrior maidens, the Valkyries, she had the ability to shape shift. She is an especially powerful goddess to use with your Moon magic, as she was particularly adept at sorcery and nocturnal magic, she is the mother of Balder the sun god, and has associations with sexuality and fertility. If you are familiar with tarot cards, the Moon is represented by the powerful and intuitive Priestess, her feet are placed on the lunar crescent curves. In Japan Tsuki-Yoma was the Moon god, and his sister Amerterasu was seen as the solar goddess and loved by all feminist witches. Even though the Moon is recognised as having feminine characteristics, the Moon is in fact a god, to the Sumerians the Moon god is Sin, the son of the sky father Enlil, and the earth mother Ninlil. Depending on the goddess you call upon when spell casting using the phases of the Moon, you are actually invoking the energies of that particular goddess. The energies of the Moon’s phase used for your magic will help to form the intention of your spell and bring it into reality via the earthplane. Call upon the particular goddess who is associated with a point in the lunar cycle, when the Moon is full call upon Isis or Dementer and during the dark time of the Moon, call upon Artemis or Hecate. Aphrodite, Isis, Inanna, Ishtar, Freya and Astarte, are all guardians of the animals. Use your intuition deciding on which god or goddess to call upon when working with Moon magic, choose the one who is most suitable for your needs. An eclipse occurs as the Sun, Moon and Earth line up and form a pattern, a lunar and Solar eclipse happen within two weeks of each other, a Solar eclipse happens during the time of the new Moon, the Moon comes between the Earth and Sun casting a shadow on the earth. The shadow of the Moon has two parts, it comprises the inner umbral shadow and the faint outer penumbral shadow. The places on Earth touched by the umbra will see a total eclipse, places under the penumbra see a partial eclipse, the entire time of the eclipse takes only a few minutes. The time of a lunar eclipse is when the earth is aligned up directly between the Moon and Sun, it casts its shadow on the Moon, a lunar eclipse takes longer than a Solar eclipse, it can take several hours for the whole eclipse. A lunar eclipse takes place on average every six months. When civilisations hundreds of years ago witnessed an eclipse it induced fear as they did not know what was happening to the light and didn’t know whether it would return, many thought it was the precursor of a disaster to come. Many cultures saw the eclipse as a creature, a serpent or dragon thought to be devouring the Sun or Moon. The firing of arrows into the air, shouting and drumming was done by the ancient Chinese people to scare away the monster. The Romans also behaved in a similar manner to scare away the creature that was attacking the Sun and Moon. The attitude these days towards an eclipse is that of a spiritual event, opening people to a higher level of understanding, and recognised as a time of spiritual evolution. Many feel a sense of peace during an eclipse, this is because the Sun’s force is calmed and we are able to go inwards giving us a greater understanding of our inner being, it is a time when the god and goddess are as one. The nodes are the two northern and southern points where the Moon’s orbit around the earth crosses the ecliptic, the nodes are a pair of linked opposites and in Western astrology, the north node represents the future and our search for happiness and success. The south node is that which we have come from and left behind, the south node is linked to inward Saturn, and the north node to the expansive Jupiter. In Vedic or Indian astrology the nodes are seen as shadow planets and are mathematically defined points in space, it is also thought they are associated with karma. The lunar rays offer a doorway between the earthly and magical worlds, and there are many goddesses who possess attributes that link them with the Moon, the attributes of your goddess of choice will influence your sacred magic spell casting. Some creatures are linked with the Moon throughout history, the hare known as a symbol of witchcraft and the lunar tides, is recognised by the Chinese and Indian people as a creature who called the Moon its home. Also according to ancient Chinese proverbs, the toad is recognized as a witch’s creature, and lives in the Moon. The bull is another Moon animal and is linked with a male Moon deity, the bull is also seen as sacred to the goddess. Each night we see one of the many faces of the Moon, and the Moon evokes a sense of mystery and magic in all of us, it is like a familiar friend who is there every night, it stirs different emotions within all of us. However you view the Moon and whatever you believe, you are affected by its changing energy, learn to understand the Moon and work with it, allow it to enhance your life.